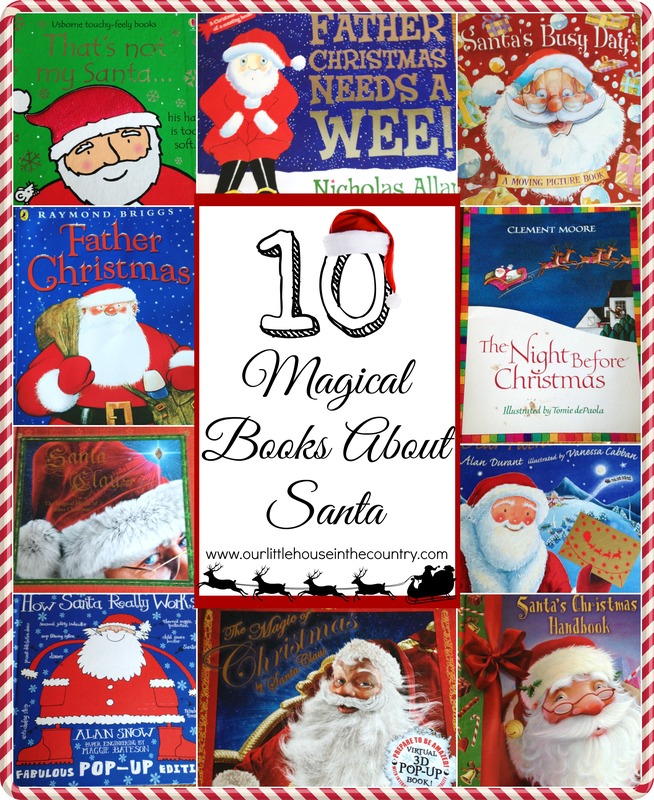 Keep the magic of Santa Claus alive for your kids this Christmas with these 10 books! 1. Santa’s Christmas Handbook – Before you even open this fantastic book, your imagination is captured by the little jingle bell attached to the outside cover which merrily jingles as you hold the book. This is Santa’s elves top-secret handbook! This super book is jammed packed with everything Santa and the elves need to know. Lift the flaps and explore the drawings to find out what Santa should do if he is spotted by a child. Learn the Skyway Code, play the board game and check out Santa’s costume and all its hidden tools and gadgets! This book by Christopher Edge aka Wordsmith Elf is so much fun and a truly magical read for the festive season. 2. Father Christmas – This Raymond Briggs classic never grows old. Given the choice my kids will read this book and watch the movie any day of the year! I love how this book gives a little insight into Santa’s life outside of Christmas Eve and did you know that he is really quite grumpy??? This irreverent look at Santa and Christmas is must have for any Christmas collection! 3. That’s Not My Santa… – Usborne’s touchy feely series always comes up trumps for the littlies! We have so many of these books and sadly now that my children are a little to old for them they have been relegated to the top shelf of the bookcase. These simple and colourful textured bard books are perfect for babies and toddlers and would make a great addition to a baby’s first stocking! 4. Santa’s Busy Day – This is a moving picture board book, perfectly pitched for the under 5s. Each cheerful picture includes a holographic image which moves and changes when the book is tilted. This is a great bedtime story for younger kiddies. 5. The Night Before Christmas – What Santa collection of books would be complete with Clement C. Moore’s magical, rhyming tale. As a child my parents read this to us every Christmas Eve before bed and we have carried on that tradition at Our Little House in the Country, This particular edition is stunningly illustrated by Tomie dePaola with every page framed by beautiful borders based on designs from New England quilts. 6. How Santa Really Works – This is a really fun book! Every page is a 3D pop up model of all sorts of Christmas magic including Santa’s home, the elves’ workshop, and a home with Santa making deliveries!! This book will answer all of your children’s questions about how Santa gets everything done! 7. Father Christmas Needs A Wee! – Described as “a funny festive counting book in brilliantly bouncy rhyme!” in the blurb on the back cover. This book by Nicholas Allan is lots of fun and is sure to have you giggling along with your children. Our copy is well-worn and dog-eared thanks to its many reading over time. It is definitely a Christmas cracker of a counting book! 8. Dear Father Christmas – I fell in love with this simply gorgeous book by Alan Durant the moment I opened it for the first time at a book fair several years ago. Throughout the book are little envelopes with tiny little letters to a girl called Holly in response to her own letters to Santa. The book is beautifully illustrated by Vanessa Cabban and the little treasures found in each envelope add more than a little sprinkle of magic! 9. Santa Claus – Rod Green takes the reader through an enchanting guide to Santa’s best kept secrets. With fantastic illustrations by Jon Lucas and Carol Wright there is something magical to discover on every page! Explore the flaps and envelopes hidden on each page, BUT, don’t forget, this information is TOP SECRET, so don’t tell anyone what you learn!!! 10. The Magic of Christmas by Santa Claus – This book comes complete with software that can be installed on your PC so that you can explore the magic of Christmas through augmented reality technology (AR). You will need a webcam to view this book at its best but it can certainly be read and enjoyed with using a computer. Similar to some of the other books in our collection this book allows you to explore the secrets behind Christmas and while a little gimmicky, the software included does add a certain amount of 3D magic and interactive fun! What are you Santa favourites? Please let us know! We love recommendations for new books!